I am bullish, but I have a little altitude sickness. I don’t need to look at 1,000 charts a night anymore because of the drafting I do behind the people on Stocktwits who do it for me. I know who to follow and what to look for when I am thinking of the market’s health and the stocks I own. 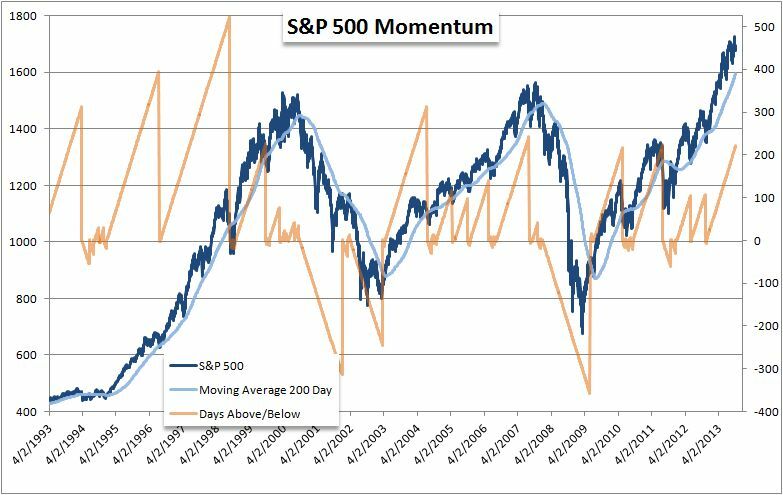 We have been trending up now above the 200 day-moving average since 2007. That is SIX plus years. I am not acting on this one fact, but it’s nerve wracking to know that the other side of this will not be fun. It is important to understand how good this stock market is, at least for those participating in it. On the more granular side of things, the ‘tape’ is just bountiful with leadership. That trumps all for me as a trend follower and I am trying to ride it out until the inevitable decline. 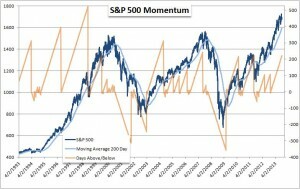 Today, the semiconductor index of stocks hit 9 year highs. The Nasdaq 100 hit major new highs as well. That’s just plain bullish for guys like me. More interesting to me though is what happened 14 years ago with the semiconductor stocks and the amazing ‘bubble’ we lived through in internet stocks and semiconductor stocks. Take for example $AMCC, which declares itself an ‘UPSTART’ to Intel on their website. An ‘upstart’ in 2013 that in 1999, had a stock trading above $600 and a few hundred billion in market capitalization. The stock markets are fascinating because they are driven by people and products. The people (employees, traders, investors) have short memories and drive the products that in turn drive the markets and the cycles. There is no ONE indicator that can make you money, just the constant putting together of the tea leaves and the risk management associated you apply. Enjoy this week’s Momentum Monday below which we talk about all this in depth with some young users of Stocktwits. what was the guy from Northern Ontario’s name?